Hi my name is Keith Lukens and I am going to tell you my story. First off the reason I am a Newsie is because my family is super poor and we needed the money. So I became a Newsie to help pay for food and other stuff we need, because I have two little brothers and a sister and they get very hungry. My father has two jobs. The one he works at a factory and the other one he works as a builder to help pay the rent for our house and for the electricity in or house. My mother stays home and keeps the house clean with my brothers and sister to help. 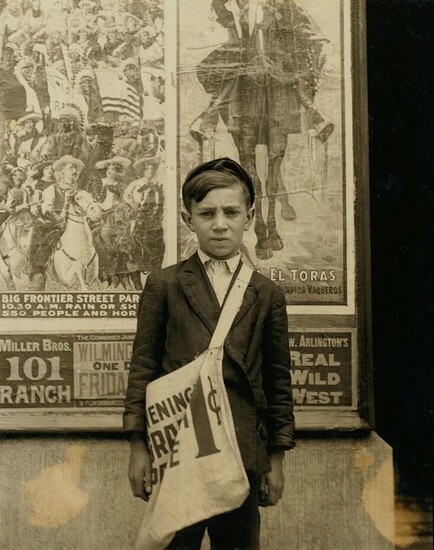 Being a Newsie is tough because you got to know how many papers to buy, how to sell them, and where the best place is to go in the city to sell them. The competition is hard on the streets because all the other Newsies have an angle or have been doing it longer than me but I make by, and I enjoy it so that helps too. My family is happy so that is all that matters. That is my life story. I hope you liked it.